I apologise for starting a new thread instead of using the existing one for books, but this book is too important to risk getting lost in the general discussion there. The moderators can merge the threads if they disagree. Long term members of the forum will know the author through his posts here and won’t need me to add anything about his knowledge and the thoroughness of his research. A few may have his book on OM cars. 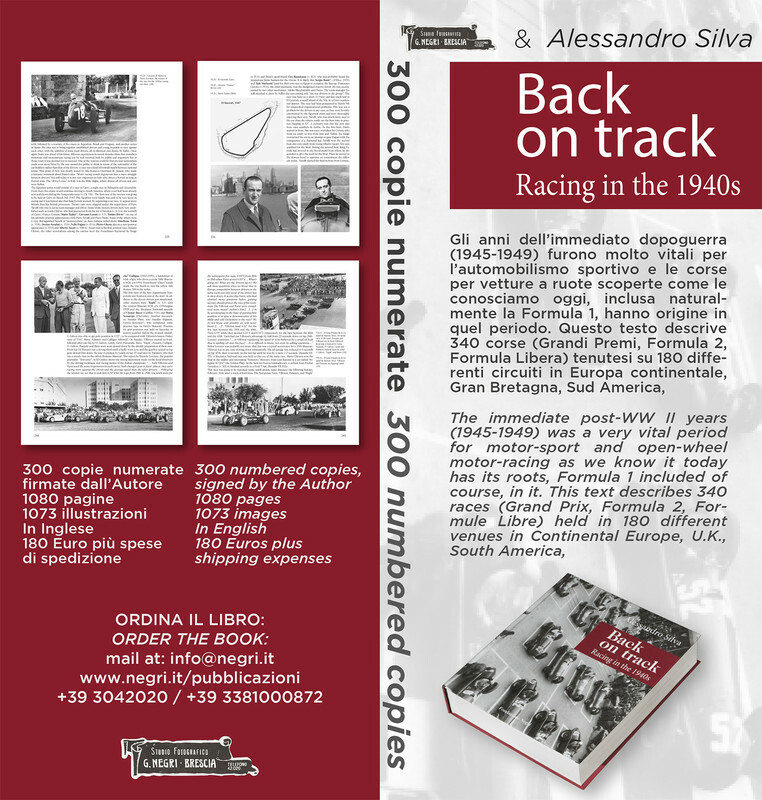 The book deals with Racing in the 1940s - 340 races at 180 different venues, 626 drivers with their complete racing records and a list of 720 other drivers mentioned in the text. All cars that took part in the 340 races are listed by make and serial numbers with complete racing appearances. 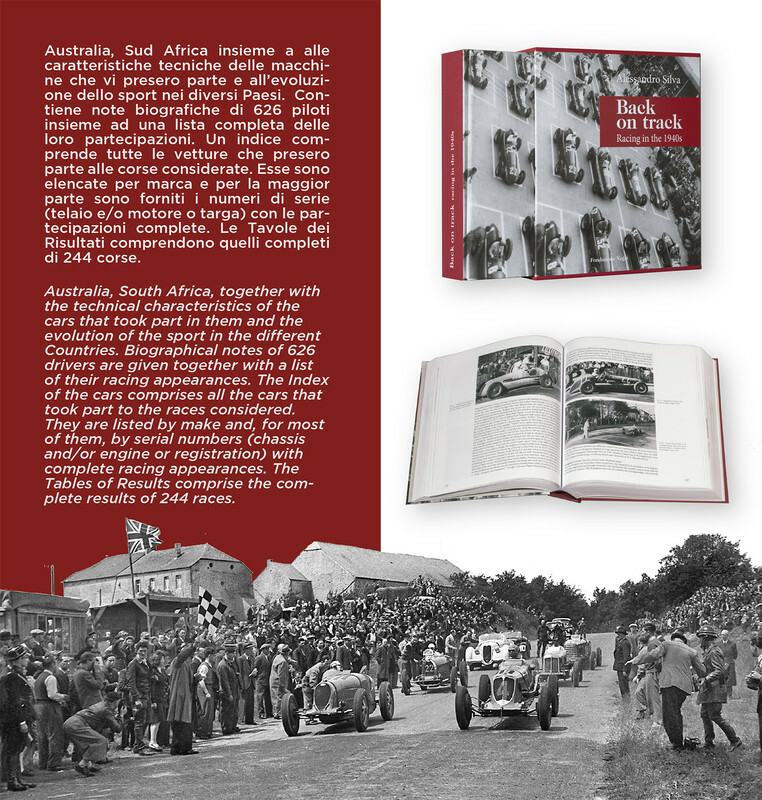 This is a badly under documented period of motor racing history but the book does much more than fill a gap. It seriously raises the bar for this type of racing history. If you have any interest in this period of racing you must have this book. If you do not have that interest, get it and you soon will have. There are 1080 pages and 1073 images. The text is in English written, as far as I can tell, with the accuracy and precision that one would expect from a professor of mathematics. The design and production quality are superb with quality paper and a robust slipcase. The acknowledgements mention, among othesr, Adam Ferrington, Richard Armstrong, Mattijs Diepraam, Jean-Maurice Gigleux, Tony Kaye, David McKinney, Barry Lake, Doug Nye, Rob Young, Aldo Zana and TNF itself. It is produced in 300 numbered copies, all signed by the author. I don’t know whether there is a UK distributor; I ordered mine from the publishers, Fondazione Negri. They can be contacted at info@negri.it. I found them helpful and prompt to deal with. The cost is 180 euros, shipping to the UK was 20 euros. It is not cheap but true quality never is. Thanks for the tip Roger. Sounds like a Must Have...but try as I might I haven't yet found the title - nor how to order it - on that Negri website. Edited by Doug Nye, 15 April 2019 - 20:16. I didn’t use the website. I sent an email to info@negri.it saying I wanted to order the book and asking how I should pay for it. They replied with the IBAN, I initiated the transfer and they acknowledged. That looks like a dream come true. Thank you Roger. Bought and paid for, e-mail to the Fondazione Negri worked perfectly (as recommended). Now eagerly awaiting delivery. Thank you Roger. Hope one day I'll be able to pay for one, it seems amazing!!!!!! Mine arrived this morning, copy number 20. I am still literally paralysed by the amount of information that Alessandro Silva has been able to unearth on the darker four years of the century as far as motor-racing is concerned. A thousand and eighty pages of relevant information! Not that this is a surprise at all -we had a glimpse of this work published at 8W sixteen years ago (!) - but it watered my eyes to see, on this also very special day for Leif Snellman (20 years of The Golden Era on the Net) that dreams can come true. We are not orphans any longer as far as these years 45-49 is concerned. We now need to read, to learn and to claim ownership of the heritage that our authorities just swept under the carpet...and that was it. Thank you, Alessandro Silva, thak also the (crazy) Italian editors, god bless them. Help!. I own up to being something of a duffer when it comes to todays technology. I have looked at the Negri website instructions on buying books and they advise you to click the appropriate title for details of payment etc. However the 'Back On Track' title is not listed. I have also contacted them and been given a Bank Transfer number which is something of a mystery to me. Has anyone managed to pay by debit card I wonder?. Any advice would be welcome, this looks too good to miss. . Here's a simple guide from Barclays; similar instructions should work for any bank. If you don't do online banking there is a paper-based option. Or, if you have a Paypal account, you should be able to pay them that way - just ask them which email address it should go to. Thank you very much Vitesse2. Much appreciated advice. .
Just ordered mine. Thanks to Roger Clark for telling us how to do it.